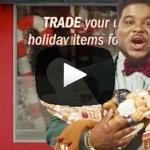 Furniture retail chain The Brick has released an online video called "The Brick's Holiday Pop-Up Tree Lot." The video depicts a temporary Christmas tree lot the company operated in Fort McMurray, AB on Dec. 3, where employees distributed free trees and wreaths to residents. The video also depicts the surprise presentation of a gift card to a family whose home was destroyed by a wildfire earlier this year. The card will cover the cost of the furniture for their new house, which is under construction. "We're overwhelmed with the response to our video and extremely pleased that we've been able put a smile on so many faces by telling this story," said Dave Freeman, president of The Brick. "We wanted to do something for our friends and neighbours in Fort McMurray this Christmas to show them their community is behind them during a very difficult time. The community has truly come together to support one another and we're happy we can be a part of that."